E-commerce has been demonstrated to be the major growth engine for businesses in the past few years and this looks set to continue. As this converges with a mobile first Internet, existing e-merchants are looking to improve and new e-merchants are looking to get started - quickly. The tremendous diversity of business models out there means that digital developers need to be able to offer appropriate e-commerce technology based on client need, not on their particular expertise or bias. The I-ntarsia Digital Service Platform offers the broadest range of e-commerce solutions in a consistent supported environment. This solution uses Drupal 8 technology, our own commerce module and i-ntarsia hosting which benefits from our stable Drupal 8 software stack. This solution uses Drupal 8 with Drupal Commerce 2.x technology. This is coupled with I-ntarsia hosting which benefits from our stable Drupal software stack. 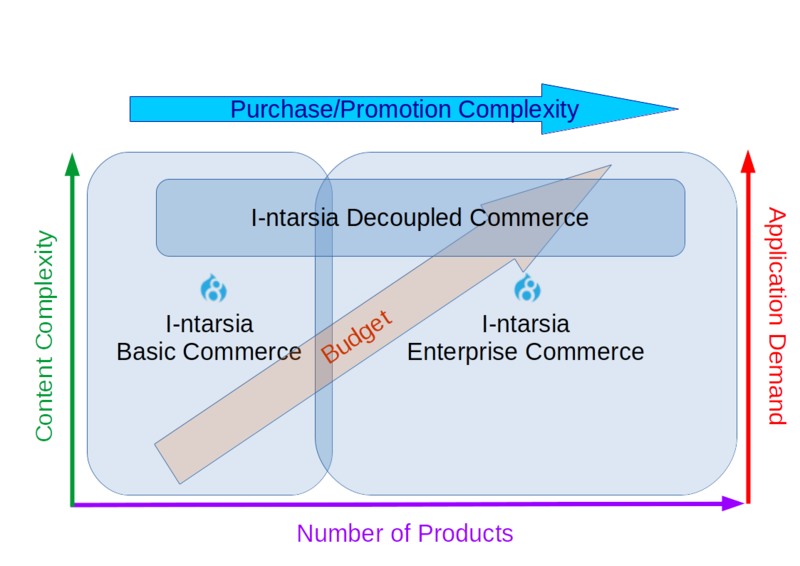 The standard I-ntarsia Enterprise Commerce platform can be customised to operate on a highly optimised infrastructure or decoupled if appropriate. OK Planned Growth: Offer an ecommerce solution that has a planned upgrade path.